Touch typing is an essential skill for today's tech-savvy kids, offering them a huge advantage with secondary-school homework and for the whole of their working life, but your child is unlikely to be taught it in school. We review six of the top touch-typing programs to help you find the best at-home learning solution for your family. Developed by an educational psychologist specifically for the UK curriculum, Englishtype is a touch-typing tutor for children aged 6-11 (Junior) and 12+ (Senior). The interface is colourful and simple to navigate, and the animated-key Professor character's calm British voice offers instructions, corrections and tips to keep learners on the right track. Our testers loved the customisation options (stickers, awards, games and outfits for the animated Professor can be "earned" by completing lessons) and the practice diary, which can be used to set personal goals and track progress. They also found the open-ended lessons much less stressful than constant "race-against-the-clock" type challenges! We were impressed with the typing learning journey on offer: key and finger relationships are reinforced with a rainbow of colours, you can access letter-by-letter analysis of your typing progress (in a surprisingly child-friendly graph format), type tests offer the opportunity to get personalised WPM certificates and special sections of the program offer extra practice for specific tricky-to-spell words, patterns and phrases. Pricing: Buy Englishtype Junior or Englishtype Senior for £29.95 each, or £44.95 for both programs. Available for PC or Mac; the software comes with an activation code so you can download it and install it on your computer immediately and you don't need an internet connection to use it. Best for: fantastic value for money – invest in Englishtype once and use it as many times as you like for the whole family! Typekids is an online touch typing course designed specifically for kids. Our testers loved the pirate theming and the gem badges and the game rewards for completing exercises and regular practice; we liked the online and emailed parent reports which offer detailed feedback about the child's progress and highlight the specific letters and key strokes that need work. For children who love gaming, access to The Pirate Arcade is a great incentive. Pirate coins are earned with practice and can be spent on game time in the arcade; new games are unlocked with practice, so there's a tangible reward for logging in and practising multiple times during the week and for working through the different exercises (which can be a little bland). Pricing: Try three lessons for free during the one-month trial period, then purchase the 30-lesson online course for $89.95 (around £70). Each user needs to have a separate licence to access the complete course (though there are family discounts available), so the cost can mount up if you have more than one child wanting to learn to type at the same time. Best for: kids who love to earn online gaming time. Touch-type Read and Spell is an online-access typing course used by the British Dyslexia Association and is particularly recommended for dyslexic learners. We loved the incredibly clear course structure and interface; your child can customise their course by choosing different colours and even whether they'd prefer to hear a male of female voice from the UK or the US offer the spoken instructions. The TTRS course is modular, with 24 levels and 31 lesson modules in each level, and there is a focus on real words used in context. One module takes approximately five minutes and you get instant feedback at the end of it (very encouraging! ), as well as statistical reports so you can check on progress. There is lots of spoken instruction and the letters are read out as you type, with every fifth module is a "dictation module" – great for helping kids reinforce their learning with a typing "soundtrack". The customer service and account management tools are also very impressive, with 24/7 support and video tutorials to help you make the most of your subscription. Pricing: Different subscription packages are available (one-, three-, six- or 12-month subscriptions for 1-4 users); prices start at £10 a month for one user. There is no free trial, but your purchase is protected by a 30-day money back guarantee if you're not satisfied. Subscriptions are automatically recurring and can be cancelled at any time and there is no contract. Best for: older children who will appreciate the clear course structure and instant feedback and aren't looking for a game-based approach to learning. QwertyTown is a web-based keyboarding app for children. It's a typing tutor, but it delivers the same user engagement and fun interface that children expect from their games and apps today: it's colourful, there's a leaderboard-style dashboard and medals are awarded for achievements like accuracy and number of words typed per minute. When students earn a bronze, silver or gold medal at the end of a lesson they're awarded QwertyCoins which they can use as currency to customise their avatar in loads of different ways and with different accessories (our testers loved this feature!). Lessons are clearly set out and the sequence is easy to follow; kids can choose to repeat them to improve their score. Each lesson is presented in three stages: Demo, Guided Practice, and Independent. In the Demo stage, students are shown how to type specific keys correctly, in the Guided Practice they type patterns with the keys (and are given help when they press incorrect keys) and in the Independent stage they are assessed. There are also assessment games to play. QwertyTown works on a tablet as well as on a desktop computer (a major plus point for most kids!) and the voice which guides you around the site is a child's, which makes it feel friendly and accessible. Pricing: A 30-day free trial version of QwertyTown lets you sample the programme to see if it's right for you; the $100 package (around £75) includes 1 Parent and 5 student accounts. Best for: tech-savvy children with a competitive streak who love online clubs and leaderboards. If your child needs or wants to learn to touch type right now, KAZ Type could be the solution. The Basics accelerated learning course teaches the A to Z keys in just 90 minutes, with lots of practice sessions, speed-building exercises and further learning for the shift, number and punctuation keys available to help you move on from the absolute essentials and improve your skills. We loved the ability to customise your screen display in the SEN edition to ensure you can read comfortably, and the typing and demo areas on the screen are clear and easy to use. You can also select UK or US keyboards and instructions, and the Junior edition uses animations and age-appropriate vocabulary to keep kids engaged. Guides to correct typing posture are also available, with typing character Kaz modelling best practice! Pricing: For a single user it's £19.95 for one year's online access or £29.95 for a Windows or Mac software download (valid for ten years, with free updates). The Family Edition, which has 5 licenses, is £59.95 for a year's online access and £89.95 to download the software. Best for: a super-fast immersion course for kids who want to learn the basics as quickly as possible. Not sure if your child is ready for a typing course yet? Test the waters with BBC Bitesize's Dance Mat Typing. It's a completely free product, useful as an introduction to touch typing and for practice but not a complete, structured course your child can follow. 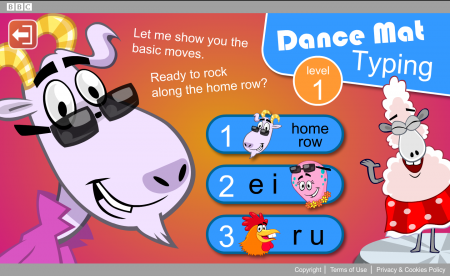 There are four levels to play, each divided into three stages, and you start by learning the home row keys, with new letters introduced as you progress. At the end of each level there's a typing-speed test and reward. It's engaging, colourful and perfect for kids, but it doesn't offer in-depth learning. Best for: offering your child the chance to try some touch-typing before you commit to a paid subscription or typing course.